Prof. Allstot has held several industrial and academic positions including the Boeing-Egtvedt Chair at the Univ. of Washington from 1999 to 2012 and Chair of EE from 2004 to 2007. In 2012 he was a Visiting Professor of EE at Stanford and from 2013 to 2016, he held a three-year appointment as the MacKay Professor in Residence in EECS at UC Berkeley. Since June 2017, he has been a Professor in EECS at Oregon State University. He has advised about 65 M.S. and 40 Ph.D. graduates, published more than 300 papers, and received awards for teaching and research including the 1980 IEEE W.R.G. Baker Award, 1995 and 2010 IEEE Circuits and Systems Society (CASS) Darlington Award, 1998 IEEE ISSCC Beatrice Winner Award, 2004 IEEE CASS Charles A. Desoer Technical Achievement Award, 2005 SRC Aristotle Award, 2008 Semiconductor Industries Association University Research Award, 2011 IEEE CASS Mac Van Valkenburg Award, and 2015 IEEE Trans. on Biomedical Circuits and Systems Best Paper Award. 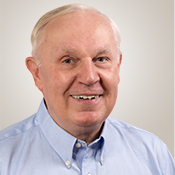 He has been active in service to the IEEE CASS and Solid-State Circuits Societies throughout his career.